As the weather heats up I find our trips outside get shorter and shorter. Instead of an hour in the morning we tend to do three or four fifteen to twenty minute visits, so my girls have plenty of time to cool off and hydrate. It’s possible I’m oversensitive to the sunshine as Autumn is still rather young and I worry about her keeping cool, but I’ve been lucky enough that neither girl has ever experienced a sunburn and I hope to keep that up. My husband is considering creating a sunshade for the backyard, either something cheap like a plastic tarp rigged up that can be removed after playtime or something more permanent like a wooden structure that will also keep the rain away since summer showers are almost daily this time of year. How you keep your cool in the summer? What do you consider too much time in the sun? Today I’m reviewing a Bummis fitted diaper. I’m a huge fan of the Bummis Whisper Wrap (an affordable yet quality cover I have in newborn and one-size and tend to call “old reliable”) so I was psyched when I received this super cute flannel fitted with a charming “Green Faeries” design on the exterior. It is very soft and pretty, and so compact it fits in even the smallest pocket on my diaper bag. Ease of Use ✩✩✩✩✩ With a single piece that fastens with strong snaps and doesn’t require any assembly this diaper is very easy to use on it’s own. You will want to add a waterproof cover, such as PUL, TPU, wool, or fleece. You may also find you’ll need to customize absorbency by adding additional soakers within the fitted, based on the habits of your child. Bang for the Buck ✩✩✩ At $24.95 per diaper, you are looking at a very affordable fitted option, however without any soakers included you sacrifice a lot of the expected absorbency, and by adding the suggested Bummis Deluxe Booster for $6.75 you’re bringing the price up to $31.70 for a fitted with a single soaker. While these diapers are very cute and certainly have their uses I would not consider this price to be comparable based on absorbency and longevity. My girls are what the cloth diaper community likes to call “super soakers” meaning they breastfeed on demand and tend to need a lot of absorbency in their diapers, especially since they both tend to release a lot at once as opposed to a smaller amount over an extended period of time. 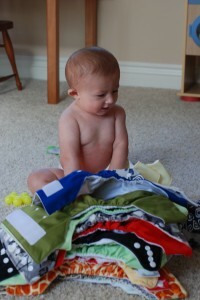 It’s possible for a light wetter these diapers may be a perfect and trim solution, it just wasn’t the experience I had. Performance ✩✩ This fitted diaper is a layer of flannel on the exterior, a layer of Sherpa on the interior, and additional absorbency sewn into the “wet zone” or main channel of the diaper. There are no soakers included, although the website does suggest the Bummis Deluxe Booster as a great way to extend the absorbency of this diaper. I had a very hard time with this diaper without a booster, it tends to get soaked in just one spot and immediately leak through the cover even when the back of the diaper is dry. I’ve tried washing it repeatedly in case it was a prep issue, which causes the decorative flannel to pill up quite a bit, but the issue is recurring. I can add a booster as suggested and it does help, though I can’t say the flannel adds to the absorbency at all, it seems about on par with using just a booster in a cover. What I DO find this cover to be fantastic for is with flats or prefolds. One issue I run into when using flats or prefolds with my breastfed girls is that the legs can lose their tightness after my very active girls have been playing for a while. The result can be quite messy, but by using the trim Bummis fitted over a flat or prefold, then adding the PUL cover on top, I’m able to keep everything contained within soft and snug elastics no matter how much my babies roll, crawl, run, or jump. Fit ✩✩✩✩✩ This diaper is extremely trim, easily the thinnest fitted I’ve come across. It offers three rise options thanks to strong rise snaps and also offers cross over snaps so this diaper can be made to fit an extremely small baby, it would have fit quite well on Autumn when she was a newborn if we had owned it then. It also expands fairly well, transforming into a trim toddler option. Overall: I like the materials of this diaper, the flannel is adorable and Sherpa is a great cotton solution for anyone with a sensitivity to polyester, it is fluffy while still laying quite flat, and soft against the skin. I do think this diaper is best with increased absorbency and wish that a soaker was sold with the diaper instead of suggested as an additional purchase. This fitted is a wonderful trim option that still fits neatly under even snug clothing, even when a booster is added. The leg elastics are perfect for ebf leak protection, and I love using these over flats as a way to secure everything for play time. I also like this diaper without a cover for outside play for my toddler, since she can run around in the backyard in a breathable option that protects her from bug bites and dirt in sensitive places.